I have been waiting to tell you all about this for weeks but had to keep my mouth shut. NO easy feat you know. I have had border collies every since Jan 2000, when I first got married and moved to Scotland to live with Charlie. Before that I didn’t really know what a Border Collie was but I had always been a fan of Lassie dog Collies. Charlie works offshore and here I was first time married, in a foreign country, didn’t know anyone and he had to go offshore for about 5 days. what to do? Well I got my first blue smooth border collie before he got home and told him if he intended to leave me and go offshore, this was what would happen. It just went down hill from there. More and more border collies. People always ask us why we have so many border collies? Our response is always: Border Collies are like potato chips, ye canna hae just one! I have 4 left of my Scotland border collies which will all turn 13 years old in May and June. They are starting to fail and we ended up having to put down 8 dogs this last year as everyone had reached their “sell by date” and was suffering. I managed 15 years with a lot of my borders and 10-11 with most of my Great Pyrs and Anatolian who are the LGD for the goats and llamas. Fast forward to now, and we sort of rescued a 1 year old border collie. Charlie wanted a male dog that was “his” even though they are always all mine. haha His name is Rick and he had been returned to his breeder with some serious issues. He is super high energy, neurotic, OCD, must have been abused in the place he was returned from and knows every bad border collie behavior that there. He also isn’t really potty trained. This has been a serious trying time. He has been with us for about 2.5 months and we are still working through these issues. 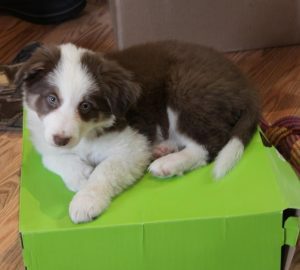 We were planing on getting several border collie pups, but were not sure when the timing would be right. I had lost my Abbey this summer and frankly it gutted me. I wanted another pup, but I just couldn’t for a while as I was so grieving for her. She was 15.5 years old and not your average border collie…a stunning bright red tri color. 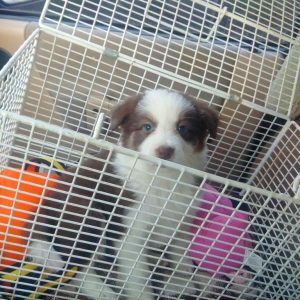 To get a slightly older pup and have to put so much work into him right off the bat…..well I didn’t think getting another little new pup immediately was a good idea. I am no border collie novice but Rick did have me pulling my hair out. I had never had one so messed up or such high energy before and he is my 10th border collie. We are still working through things but we are starting to settle down a bit so…. 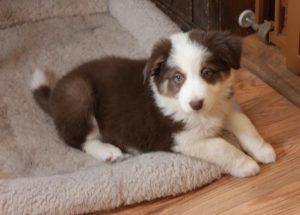 While hubby was offshore this last time, I went and got me MY border collie. 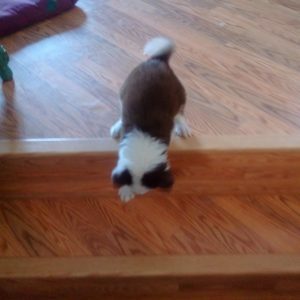 Losing my Abbey, I was on the hunt for another red tri color….you know just in case Abbey decided she wanted to return in another fur body. I told her before she passed that I didn’t know if I believed in reincarnation or not but I was willing to give it a go if she was. 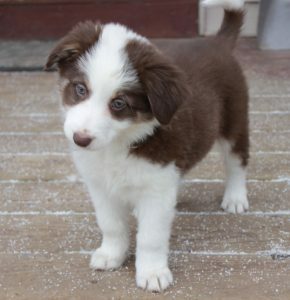 Two and a half weeks ago, I got my darling new border collie pup. She was a bit too young from the breeder but we counted wrong on the calendar and realized it the next day. Since I had experience with border collies, she came and stayed. 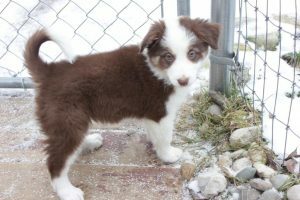 Charlie said I could get whatever dog I wanted and whatever color I wanted without any interference from him, I could get her when I was ready as he said he was always ready for a new border collie pup and that she would be mine. I decided to take him at his word. This one is all mine. Well they are all mine really, but this one is really really mine. I went to get her sister as the breeder said he had 3 reds, and 1 tri. I got there and he said that he made a mistake and he had 2 reds and 2 red tris. The sister was heavily marked with prominent tan points and the one I came home with has less tan points. I wanted those tan points but that pup screamed bloody murder every time I touched her. The one I came home with was in my arms and all calm. AND….she started talking to me right away. I can talk to a lot of animals but have not ever really talked to one so young or so new so quickly. She said to not worry about those tan points as she would make up for it personality…more than make up for it. I was trying to ignore her as I was focused on wanting to have the other pup. But she kept yammering on in my ear. Morag told me that she was the one that I wanted and she put her feet on my chest and stood up in my arms and looked direct and deep into my eyes and said, “IT IS ME!! !” I tried to ignore her but couldn’t after that. The breeder was fascinated with how she was reacting to me. Shortly after Abbey passed, Charlie told me that our next red tri border collie was to be named Morag. I asked him why and said he chose the name Morag which is Gaelic for Maggie. Our Abbey was supposed to have been named Maggie and the farmer had intended to keep her. The farmer wasn’t to home when we went to look at the pups and the wifie didn’t know her husband’s intentions, so we went home with his Maggie who was our Abbey. Our new Morag comes from a line of Maggies and Abbeys as well. Her mom’s name is actually Maggie and her grandmother was Abbey. I already have a nickname for Morag which is Aggie. Half Maggie and half Abbey….Aggie. I couldn’t tell you all about her because I didn’t tell Charlie about her. I decided to surprise him and picked him up from the airport with her. I had her stuffed in my coat and after he leaped in and got his seat belt on, I causally handed this wiggliy squiggly ball of fluff to him and told him to hold her because she was too wiggly to drive holding her. He never knew as I kept my mouth shut for 2 whole weeks. She started to lick him all over and promptly peed on him!!! Our Cinnamon, who is now almost 13 years old and is our original Abbey’s daughter, had puked on him her first car ride with him. So if you pee or puke on dad, you get to stay! she is only 8.5 weeks old now but almost impossible to photograph as she is just a wee little bluuuurrrrr most times. What do you think of my darling Morag…little we Aggie?